"Interview with CEO" in this issue will provide the detailed information on the VisSat-1. 29th AIAA International Communications Satellite Systems Conference (ICSSC-2011), will be held in Nara City, Japan, from 28 November to 1 December, 2011. "It's all about building relationships. If you build a good relationship, you automatically build international good will, strengthen partnerships, promote interoperability, avoid technological surprise, and perhaps most importantly, accelerate S&T achievement." "We also think that one of the most important elements for satellite communications in the future is to better educate the public, and especially public policy makers, about the potential for satellite to provide high quality and high performance connectivity in the future." In our interview, ViaSat Inc. Chairman and CEO Mr. Mark Dankberg speaks passionately about his business strategies for worldwide satellite communications in Ka-band broadband applications. A Soka University pico-satellite Negai���hwas launched on May 21st, 2010 at Tanegashima Space Center, Japan to decay on June 26th, 2010. The satellite is a CubeSat that measures just ten centimeters cubic and weighs a mere kilogram. Its orbit is 300km altitude with 30 degree inclination. At 300km altitude, the satellite plunges back into the atmosphere, creating an artificial "shooting star" after a few weeks. Hence it is named NEGAI or �gWish upon a shooting star.�h In 30 degree inclination orbit, the satellite does not go beyond over 30 degrees latitude either north or south. In order to access better, three ground stations were constructed one in Soka University campus and others in two remote islands. Negai���fs mission will be two-fold. It will serve as a test bed for a highly advanced information processing system with FPGA (Field Programmable Gate Array) that is extremely reliable and resistant to intense cosmic radiation. It also aims to spur interest in space exploration among children. Negai���h contained on microfilm the names and dreams of children recruited through a public campaign. The most important aspect of this satellite is that it is hand-made by the students. "An internal study meeting for CS digital broadcasting was written at the last part of the previous article. It has been developing into the "SkyPerfect" business. The one performed concurrently at this period is the next communication satellite JCSAT-3 project. I participated in both two projects in order to combine these two. I'll write about a start-up period of the CS digital broadcasting as well as also the J-3 satellite at the current 5th and the next 6th (final)." Learned from Development of CS "Sakura, Cherry in English", blooming in the universe of "Showa". We have interviewed with Dr. Akio Iso about satellite phone and TV relay services provided for Japan's remote islands. He talks international situations in the early 1970s, when the Japan's communications satellite "Sakura" was embodied, the popularization of television and telephone, public telephone services in the future. "NICT maintains and supplies the Japan Standard Time. In order to maintain the national standard times, it is necessary to compare the individual time standards among various countries, measuring precisely what you are going slowly or fast." The time comparison experiments have been conducted using a communication satellite. Miho Fujieda, who are engaging such experiments with China, India, Germany, Russia, etc., writes country styles learned from the experiments. "Even if we have failed in the system, I try to act responsibly, considering what is the best for the customer at first, what we should do and how we prioritize" Ms. Miki Suzuki, SKY Perfect JSAT, appears in this issue's "Satellite Communications and I". She talks passion to experience the universe through high school, college to graduate studies in infrared astronomy, to recent jobs since the merger of three companies after joining. 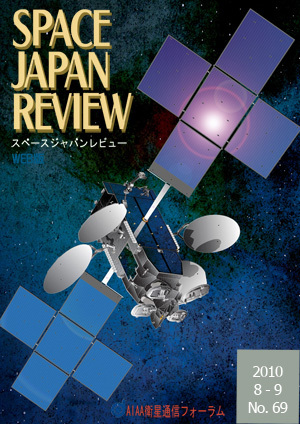 The annual meeting of AIAA Japan Forum on Satellite Communications (JFSC) was held on June 1, 2010 at the Akihabara satellite campus of the Tokyo Metropolitan University (TMU). Prof. Hajime Fukuchi of TMU, who is also the Secretary General of JFSC, reported an annual activity in 2009, a fiscal report, an auditing report, an activity plan and a budget plan. Mini-symposium with the theme of "National Security and Satellite Communications" was held simultaneously. The next AIAA ICSSC will be held in Nara City, Japan from 28 November to 1 December, 2011. Please find the important date for submission. The workshop organized by IEICE Technical Committee on Satellite Communications was held in Kitami, Hokkaido. In July 2010, Technical Committee on Satellite Communications (SAT) was held in the Kitami Institute of Technology, which is located in Hokkaido island, with the Technical Committee on Antennas and Propagation (AP). A theme of the joint conference is "antennas and propagation technologies used in satellite and mobile communication fields." Many general presentations and two special talks, organized session, and one special speech organized by AP-S Japan Chapter were conducted. NEC is awarded a contract titled "R&D on free-space optical communication technologies" by the Ministry of Internal Fairs. "Quasi-Zenith Satellite" will be launched soon. Will a satellite stay around the zenith of Japan. What can happen?